Many important changes occur at specific periods in pregnancy in both the woman and her unborn baby. This is the reason antenatal care exists to evaluate the woman periodically to ensure that her pregnancy is progressing normally through these periods. Once a woman misses her period, one of the possible things that should be assumed is pregnancy, though there are other causes of a missed period in a woman. In considering pregnancy, the woman is required to do a pregnancy test. If the test comes out positive, it means she is likely pregnant and the next thing is to estimate how long she has been pregnant. Some women don’t keep track of the length of their menstrual cycle and how long they menstruate during their period, and this can lead to a wrong estimation of the age of the pregnancy by the doctor. Hence, it is important every woman keeps track of her cycle length (you can do this with the cycle planner in the Kangpe Android app) and how long each menstrual period lasts to ensure an accurate estimation of how long she has been pregnant once a pregnancy test is positive. The first day of the last menstrual period marks the beginning of another menstrual cycle and is used to estimate pregnancy age (gestational age). This method may not be very accurate in estimating the age of the pregnancy, prompting some obstetricians to combine it with an ultrasound scan to get a more accurate estimate. As the pregnancy advances, from 8 weeks onwards, the age can be estimated using a tape rule measurement of the woman’s tummy which is usually part of the physical examination pregnant women undergo during an antenatal clinic visit. Once a woman learns she is pregnant from a positive test, the next thing she wants to know is when she will be due. This is called the expected date of delivery and the obstetrician uses the first day of the woman’s last menstrual period to make this calculation. The expected date of delivery, though a specific date, is interpreted as a range of dates by the obstetrician. If the expected date of delivery is the 20th of November this year, for example, the obstetrician will tell the woman that she will likely give birth either within one week before or one week after this date, meaning she has to get herself ready for delivery one or two weeks before this 20th but may have the baby within days after this date. Having an accurate estimate of the age of pregnancy helps the obstetrician to schedule when next to request an ultrasound scan for the woman after the first scan has been done in the first trimester to confirm the pregnancy and also to help in estimating its age. The second ultrasound scan is usually done in the second trimester around 18 to 22 weeks to assess the physical appearance of the unborn baby. A third ultrasound scan may be needed during the third trimester to check how well the baby is growing and to ascertain whether the volume of the amniotic fluid in the womb is optimal for the baby. After the first antenatal clinic visit, which is usually around 12 weeks and should not be later than 16 weeks, the pregnant woman is expected to come to the antenatal clinic every 4 weeks until the 28th week. From 28 weeks onwards, she will receive antenatal care every 2 weeks until the 36th week after which she has to visit the clinic every week until she is delivered of her baby. 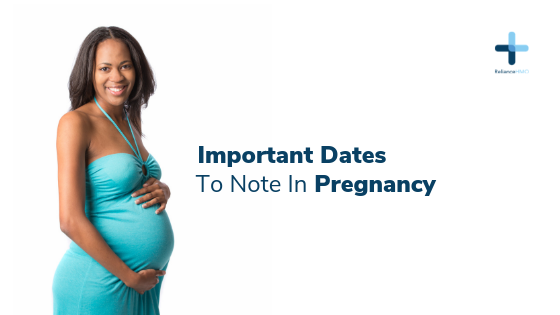 There are other important dates in pregnancy, like when to receive the subsequent doses of the tetanus immunisation, and every pregnant woman should write them down or input them into her phone’s calendar with a reminder alarm a day earlier so she can receive the specific care scheduled for those dates, to ensure a healthy pregnancy.